Curious mechanics: a closer look at the fascinating mechanisms of Ugears models. 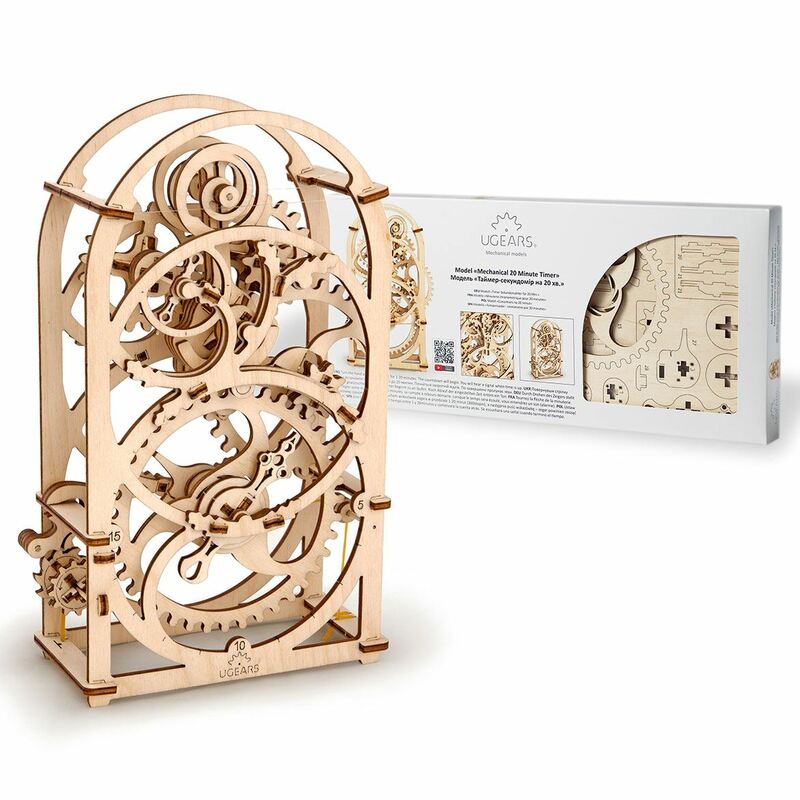 Trying to explain what exactly makes Ugears models so attractive is virtually impossible. 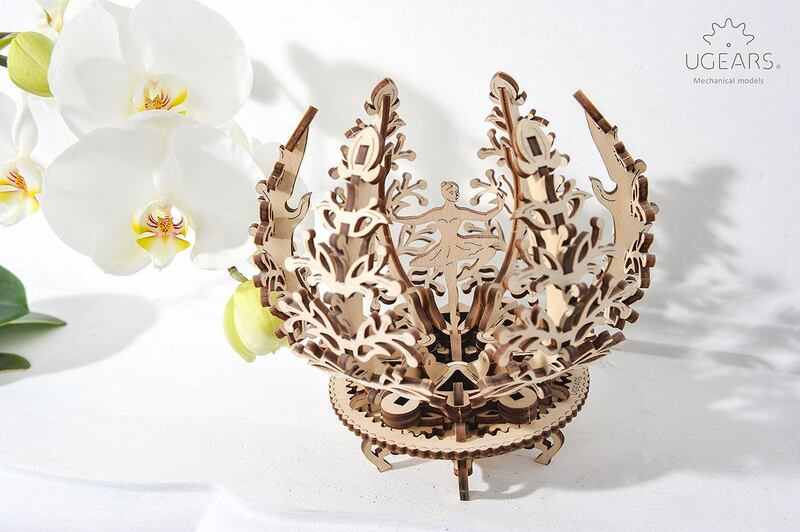 For someone it is the beauty of wooden designs, another will fancy the process of putting the parts together to create a moving interactive model. Parents will surely appreciate its educative value aiming to introduce their kids to the world of engineering, math and science via games and fun. 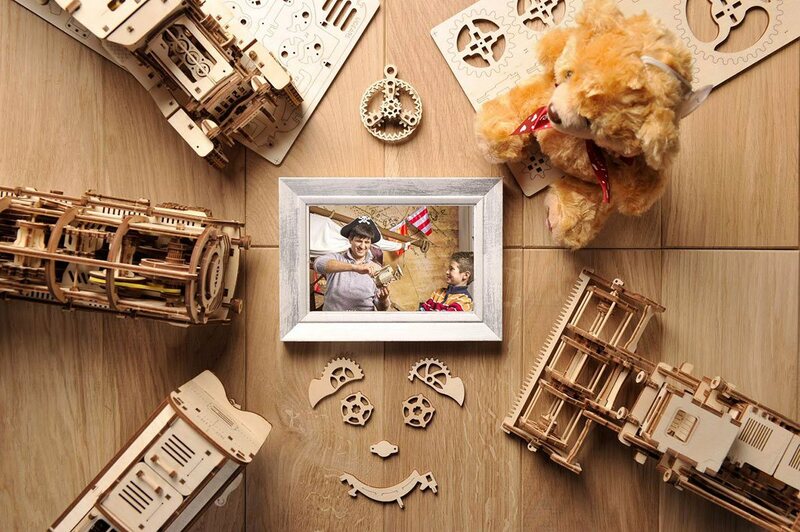 All in all, Ugears models look like a perfect mix of attractions to get you into the curious and exciting world of mechanics. Today we would like to go from the general description to the more specific constructional peculiarities of Ugears models. What makes all those part move? What makes the gearwheels rotate? How does it work? Ugears knows the answers and is willing to share them with you now. 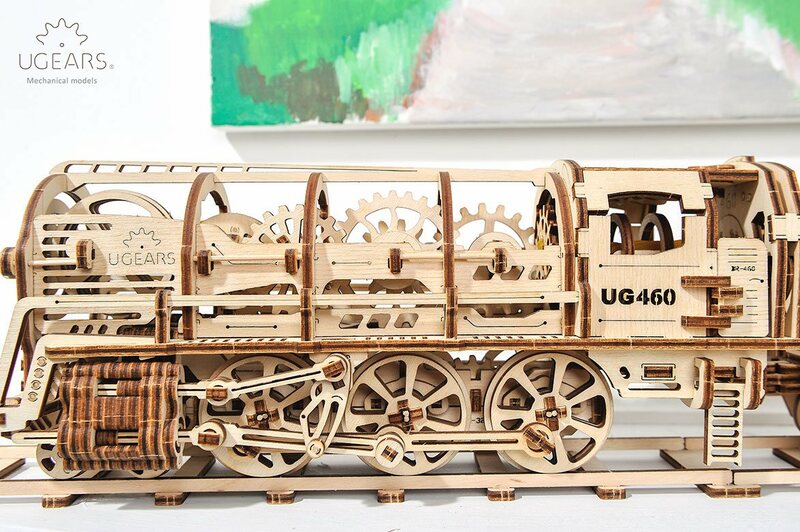 The Locomotive is one of UGEARS’ most complex models that has lots of details and mechanisms. 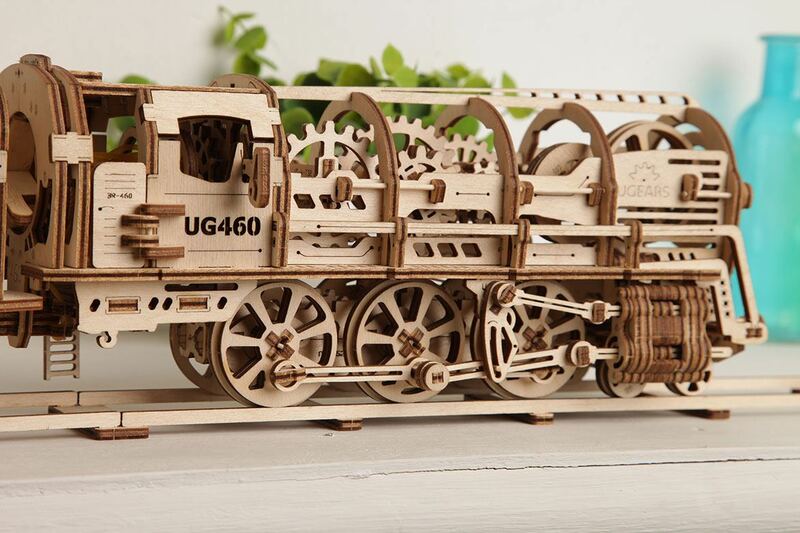 It is certainly not merely the complexity that makes the model so fascinating and ensures its popularity from day one, but a possibility to explore, understand and assemble an extremely realistic DIY steam train. 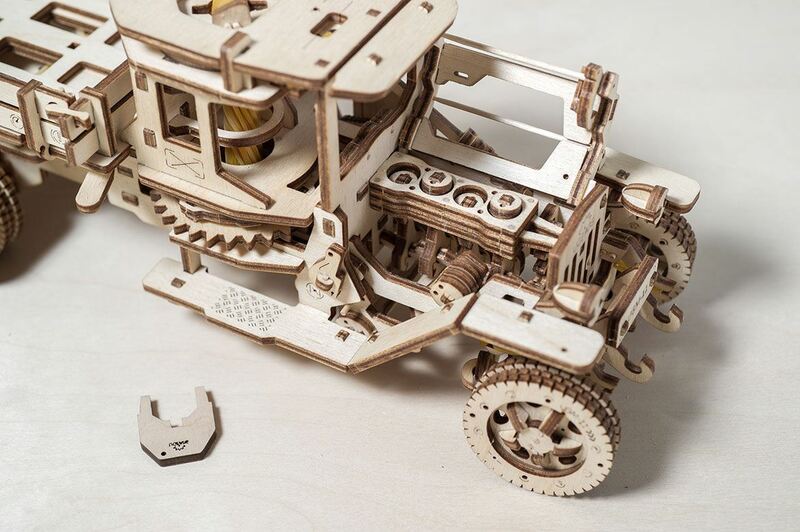 In this case, we mean not only realistic design – which is undoubtedly above all praise – but also fully functioning components, blocks and mechanisms. Now, we’d like to focus on two of those mechanisms in more detail. A crank gear is one widely used mechanism that many of us are familiar with and had to deal with many times – without thinking what is actually was. Surely, we will not be confused with a simple description of the principle of its work, stating that “The crank mechanism converts circular motion into reciprocating motion”. Nevertheless, what exactly does the crank gear do in a locomotive? A steam train’s primary source of energy is a boiler that transfers the superheated steam into the steam-engine. The steam-engine transforms the power of steam into reciprocating motion of the piston that is turned into rotational motion by the driving rod. From which it becomes apparent that the crank mechanism is used in the construction of driving rods. 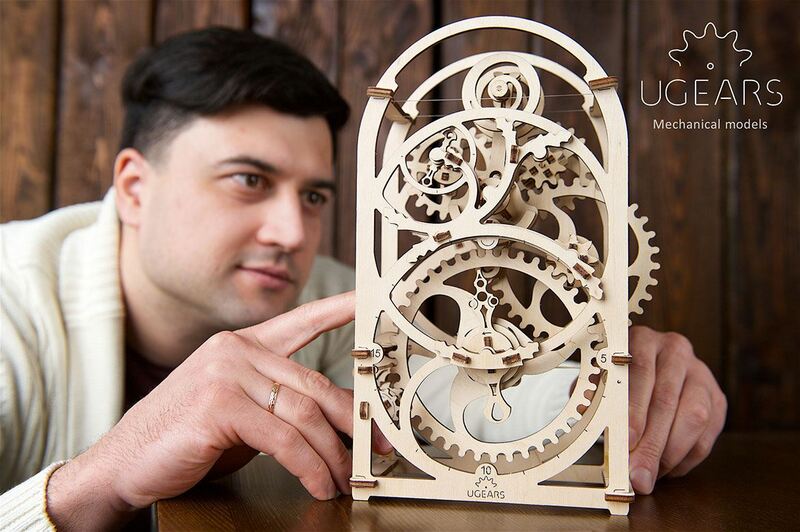 Ugears’ “Locomotive” uses the same principle: the motion of the piston transforms into the rotation of the wheels. With one distinction: the piston is driven by the rubber band motor. The Locomotive model also uses a flywheel – the device that efficiently stores rotational energy. In the Locomotive the flywheel ensures a smooth launch and slowing down. As soon as it’s released, the rubber band motor spins rapidly because the elastic band shrinks almost immediately. The solid and heavy flywheel receives the energy of the motor and changes the rotational speed by its moment of inertia. This makes the model start and stop more smoothly. 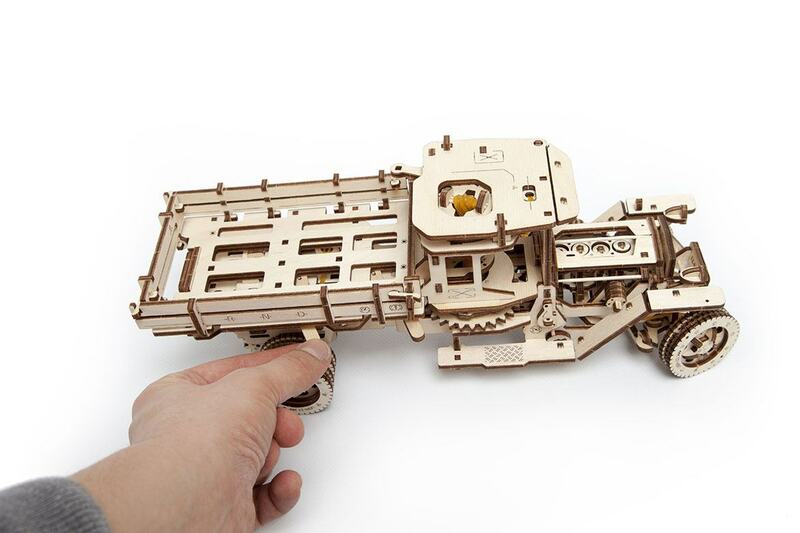 If you chose to assemble the Truck model, you will have a chance to explore the operational concept and design of such interesting devices as a ratchet, freewheel and transmission. The ratchet is a mechanical device that allows continuous rotary motion in only one direction. It is shaped as a tooth wheel with asymmetrical teeth having a moderate slope on one edge and a much steeper slope on the other edge. The ratchet is often used in wind-up mechanisms, tire jacks, wrenches, tie-wraps, etc. In UGears’ Truck it has a spring loaded pawl and prevents the rubber band motor from release while being wound up. The rubber band motor will start when the drive gear on its back side is released. In some devices, the ratchet wheel becomes unlocked with the release of a pawl. 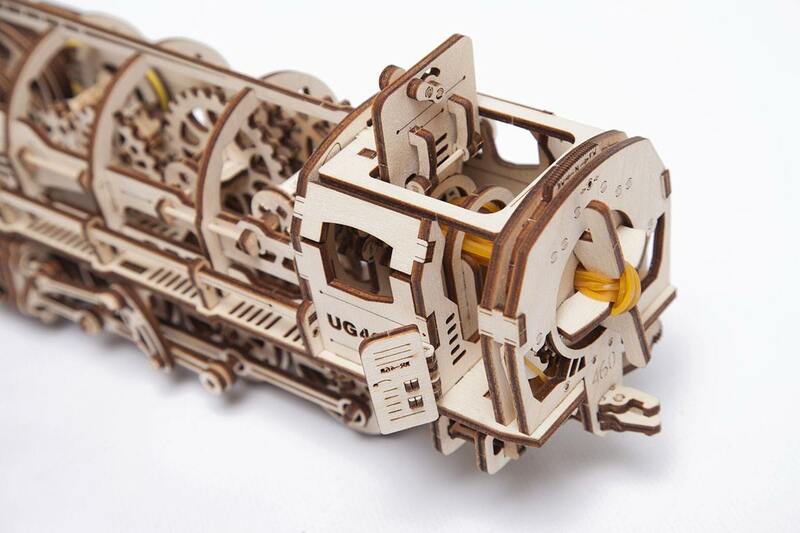 The free-running coupling ensures that the model and some of its parts continue to move for some time after the rubber band motor has finished its work. In many devices, gearing is implemented in a permanent coupling. In this way, when the drive gear stops, it blocks the whole mechanism interrupting the movement. The Truck model lacks a permanent coupling, using a freewheel connection instead. It ensures that even after the rubber band motor has stopped the gearing driving the axles, also terminating their rotation – but the wheel axle keeps on going and the Truck is rolling forward. 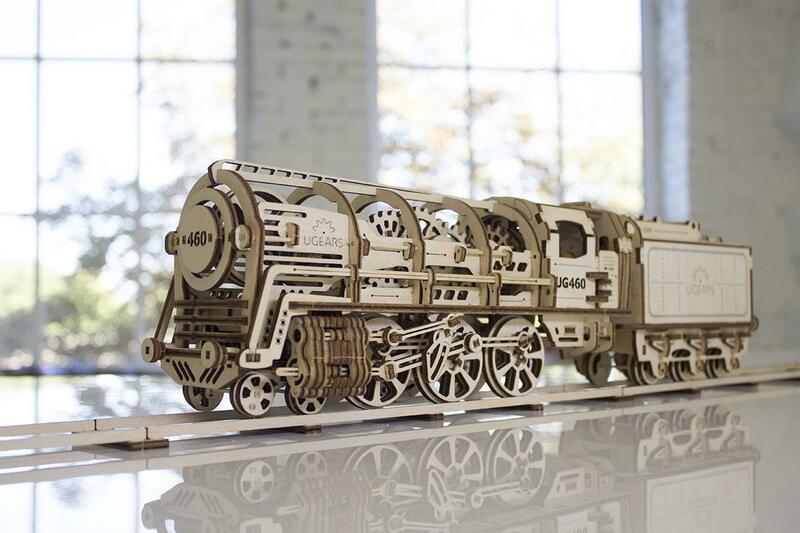 Unlike the Locomotive that switches from moving forward to going back by changing the direction of winding up its rubber band motor coupled with the flywheel - i.e. different direction of the rotation of the driving gear - the Truck is operated by a proper transmission. It is implemented by means of two gears on either side of a free-running axle that connects to the driving gear. While the driving gear rotates in one direction, the gears connected to it on opposite sides would rotate in different directions. Connected to the driving wheel one at a time they move the axle backwards or forwards. 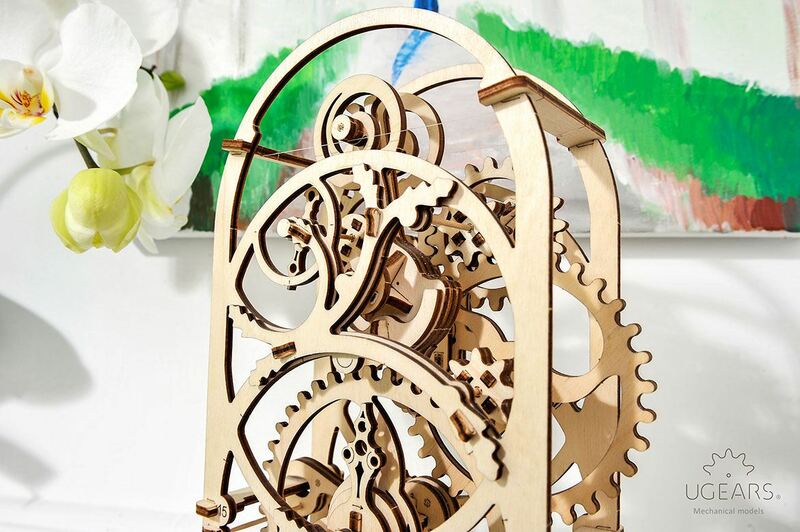 Delicate petals of the Mechanical Flower are driven by a type of gearing called “the scotch yoke”. It is also known as a slotted link mechanism, which pretty much describes what it actually is. The scotch yoke is a reciprocating motion mechanism, converting the linear motion of a slider into rotational motion, or – as in the case of the “Mechanical Flower” – vice versa. 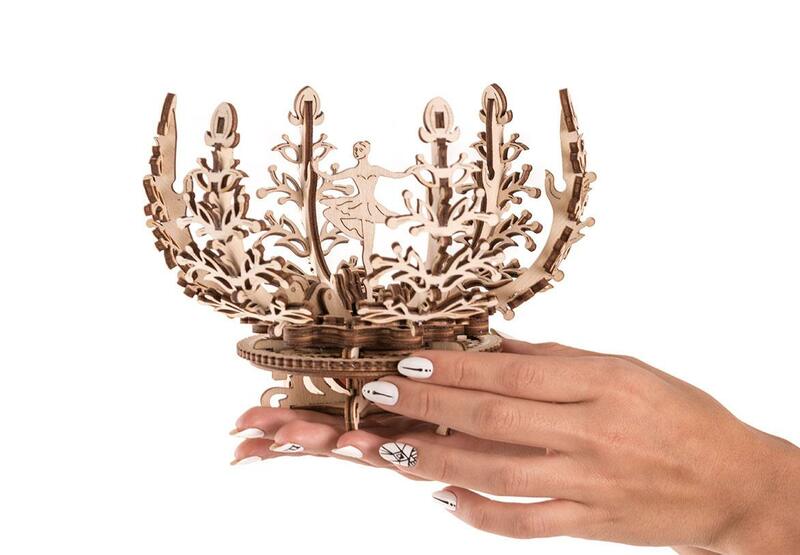 The model’s mechanism is made of two details. One of them is the gearwheel with a pin, the other – the detail with a slot which engages the pin. Rotating the base of the “Flower” we can observe how the petals open and close. The Timer is an example of classic mechanics: the core of this model is a pendulum clock escapement. A clock escapement is a device that transfers energy to the timekeeping element and allows the number of its oscillations to be counted. There are several types of escapements, but the Timer uses a modified anchor escapement. The Timer can be set for a period from one to twenty minutes. Setting the arm on a certain time stretches the rubber band and starts the mechanism. With each swing, the “Timer’s” pendulum blocks the teeth of two gearwheels installed symmetrically on its sides, which pauses the whole mechanism for a brief period of time – until the pendulum starts its swing to the other side. The energy of the stretched rubber band is also regulated by the flywheel in the upper portion of the pendulum. 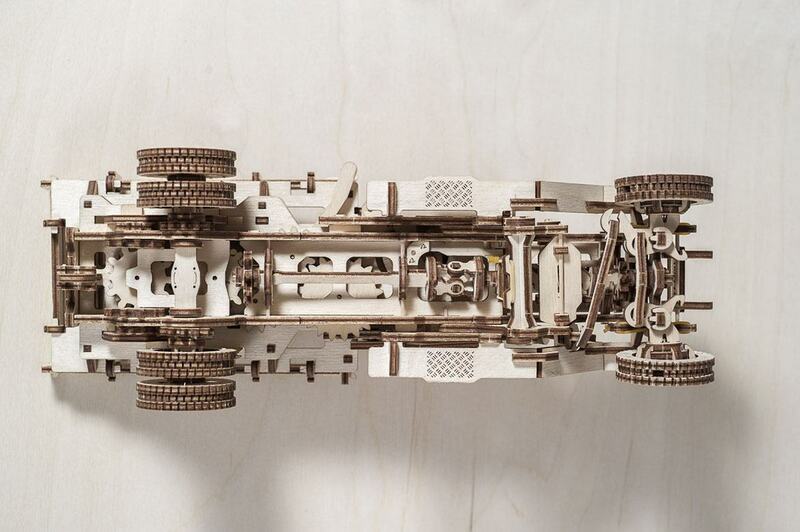 The model also has a fine-tuning wheel that adjusts the pendulum’s-gear links mechanism.